Pamela Lerner's Home and Design Shop has a presence in the intimate one lane town of Bellport Village for nearly 14 years. Susan Frei Nathan Fine Works on Paper first showed with PL H&D in September of 2006. New to the town at that point, Pam was cultivating a following with local homeowners and weekenders from New York and Brooklyn, outfitting their antique homes in the village. Lerner's aesthetic point of view with home goods, furniture, and art informs her curatorial perspective, and she stands out for her passion for objects and unique displays. Outside she exhibits her garden furniture next to a floral design shop with live floral arrangements highlighting these one of a kind pieces. It is a privilege to share these botanical portraits with her clients and hope we can masterfully build interior gardens of plant portraits for her devoted patrons. 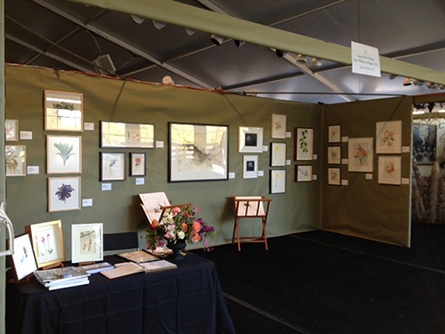 This spectacular collection of contemporary botanical art on vellum and paper features leading artists from the US and UK, represented by Susan Frei Nathan Fine Works on Paper LLC in the ILevel Gallery Space (37 E. 7th St, New York, NY 10003). These original watercolor paintings and drawings are all one-of-a-kind, singular pieces of art, created by global master artists in the botanical art tradition. Highly detailed and exquisitely painted, each piece in the show is selected to create a lush interior garden on the gallery walls. All works of art for sale. Opening breakfast: Friday, November 4, 9 – 11 a.m. Floral-inspired food and beverages accompany a talk by Susan Frei Nathan about contemporary Botanical Art. RSVP to michelle@ilevel.biz. Susan Frei Nathan Fine Works on Paper will be exhibiting works in the MADE section of the Architectural Digest Home Design Show 2015. This spectacular collection of contemporary botanical art on vellum and paper will feature leading artists from the US and UK, represented by Susan Frei Nathan Fine Works on Paper, LLC. The exhibition will take place in Old Lyme, CT at the Diane Birdsall Gallery. Magnifying glasses will be provided for closely viewing the detailed drawing and brushwork inherent in this art form. Enhancing the show will be scheduled talks by Susan Frei Nathan, leading dealer in this genre, to further the knowledge and understanding of this long-held tradition that continues today. In addition, a demonstration by Beverly Duncan, an artist featured in the show, will occur on June 5 from 11 a.m. - 1 p.m. The opening reception will take place on Thursday May 1, from 6-8 p.m. Gallery hours are Wednesday - Saturday, 12 - 6 p.m. and Sunday 1 - 4 p.m.
A wonderful report about the show appears in Connecticut-based publication The Day. Susan Frei Nathan Fine Works on Paper participated in the New York Botanical Garden’s Garden Sculpture and Antique Fair, April 26 - 28, 2013. This was a special opportunity to see a large selection of our works on display. The newly revamped Fair is now featuring contemporary works, and we were excited to have been selected as one of the new exhibitors. You can read more about our experience at the Fair on our blog. The show was reviewed in the "Antiques and the Arts Weekly." "The Magnified Eye: Contemporary Botanical Portraiture," an exhibition of watercolors and drawings on paper and vellum took place at the Reeves-Reed Arboretum, 165 Hobart Avenue, Summit, NJ from April 1 to August 10, 2012. Please visit the exhibition's page to view a slideshow of the artwork that was featured in this show and to sign into our guestbook. The New York Botanical Garden hosts a "rare look at one of the world's finest private collections of contemporary botanical art" that includes works by instructors and alumni of the Botanical Garden's Botanical Art & Illustration Certificate program. The show entitled "Botanicals: Environmental Expressions in Art: The Alisa and Isaac M. Sutton Collection" is on view from September 4, 2010 until January 9, 2011 in the Arthur and Janet Ross Gallery. The American Society of Botanical Artists has organized an important traveling exhibition "Losing Paradise? Endangered Plants Here and Around the World". Of the 125 entries received only 43 artists works were selected. Five artists represented by Susan Frei Nathan have been accepted into this juried show: Jean Emmons, Lara Call Gastinger, Rose Pellicano, Lizzie Sanders and Carol Woodin. They captured the endangered plant life in its natural habitat working from real-life specimens within their short life cycle. These images provide useful information for scientists studying the effects of global warming on nature and as a record for posterity. The traveling schedule for this exhibit visits: Missouri Botanical Garden, St. Louis, Missouri from October 1 - November 15, 2009; Chicago Botanic Garden, Glencoe, Illinois, January 16 - April 11, 2010; The New York Botanical Garden, Bronx, New York, May 6 - July 25, 2010; and finally to the Smithsonian National Museum of Natural History, Washington, DC from August 2010. Susan Frei Nathan is co-curating an exhibition of the largest known collection of contemporary botanical art in North America. Botanicals: Environmental Expressions in Art, The Alisa and Isaac M. Sutton Collection will premiere at The Hunt Institute for Botanical Documentation on Thursday, October 22, 2009 and run through June 2010. A full-color, illustrated catalogue will accompany the exhibition. James White, Curator of Art at The Hunt Institute says, "This exhibition represents one the finest private collections of contemporary botanical art in North America. These 54 artworks are expressions of the purely aesthetic forms found in nature and a reminder that we are stewards of our natural resources for future generations." Kate Nessler's most recent paintings from her "Of Two Minds" series are currently on exhibition at the Garden Museum on Lambeth Palace Road, London, England. All paintings are for sale and on display from June 2-30, 2009. Lara Call Gastinger's work will be featured at Monticello's Jefferson Library in A Biographical and Botanical Art Exhibit from May 3 - November 12. The Library is located at 1329 Kenwood Farm Lane, Charlottesville, VA.
Susan Frei Nathan Fine Works on Paper recently exhibited at Furbish Home in Millburn, NJ. Carol Woodin has received an award from the Lankester Botanical Garden in Costa Rica. They are known for their orchid research and a highly esteemed publication devoted to orchids. Here are excerpts from the letter she received, "the first Lankester Award for Orchid Art for your extraordinary contributions to the knowledge of the orchid family through botanical art. Your numerous works in major art collections of botanical galleries around the world and your outstanding contributions to the illustration of important botanical treatments of orchids such as the endangered genus Paphiopedilum have contributed to increase the appreciation and understanding of orchids. The positive message that you are transmitting though botanical art has helped significantly to increase the awareness of the importance of protecting this fragile family." The Washington Post published an article about Flora of Virginia, an important manual of plants for Virginia that was the completion of over a decade of work by Lara Call Gastinger. It includes 3200 taxa of 200 plant families. Lara contributed 1300 inked line illustrations and the color painting for the cover. A botanical watercolor painting of Thomas Jefferson's tennis ball lettuce, painted by Lara Call Gastinger, is featured in "A Rich Spot of Earth," a recent book by Peter Hatch about the Monticello gardens. 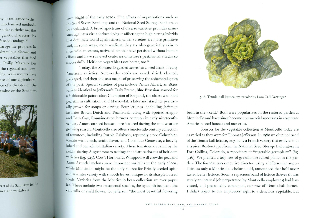 "A Charlottesville botanical illustrator, Lara Call Gastinger, has used Monticello vegetables as subjects for a series of watercolors on cultivated crops" (p. 110, 115). Kate Nessler will receive the 2010 Ozarks Ambassador Award from the North Arkansas College Foundation. The selection committee honors Kate for her achievements in portraying the Ozarks through her art. Carol Woodin will be featured in an article in the May 2010 edition of The Artists Magazine. Look for "Beauty that Lasts, Keep Florals Fresh: Four artists reveal strategies in pastel, watercolor, colored pencil and acrylic." Beverly Duncan was featured in the Home and Garden section of her local paper, The Recorder on January 31, 2009. She is exhibiting her work at Elmer's Store in Ashfield, Massachusetts in May. Elmer's Store, 396 Main Street, Ashfield, MA. Lara Call Gastinger is featured in the March 2009 issue of Southern Living magazine. Towards the back of the issue is a bonus section for mid-Atlantic readers called "Mid-Atlantic Living: People and Places." Lara's article appears on page 12, entitled "The Art of Nature." Susan Frei Nathan Fine Works on Paper was chosen by the readers of New Jersey Life Magazine for the publication's 2009 A-List - a list of editor and reader favorites from around New Jersey.